AVON, Ind. 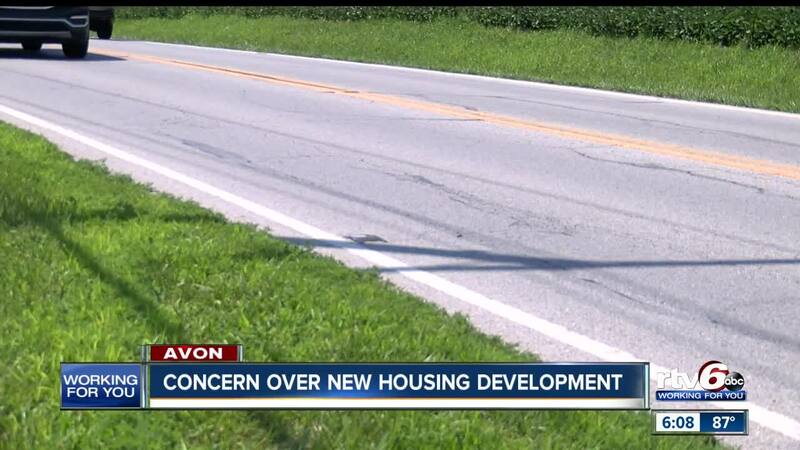 -- People living in Avon are concerned about a planned neighborhood development that would affect traffic on an already busy two-lane road near Avon High School. The proposed Fairwood Development would include hundreds of houses and seven acres of office space. The big issue, though, is that the entrance to the neighborhood would be right on Dan Jones Road – which is only two lanes wide. Lowell Jackson lives near the proposed development and says Dan Jones Road is already too busy for the traffic that uses it, and the town needs to focus on improving the road first. The Town of Avon says they do not comment on proposals that are under review but they say the town reviews traffic impacts that may be caused by the new developments when they are making their decisions. They say the Fairwood proposal is still in the early stages of the town’s process and the next step would be a public hearing at the Planning Commission meeting on August 27 at 7 p.m. The Coalition Responsible Growth in Avon issued the following statement about the proposed development to RTV6. The Town of Avon is a great place to live but seems to be approaching a critical point. Rapid growth has caused our two-lane roads to be congested, our schools to become overcrowded to the point of needing a tax increase, and the community infrastructure is rapidly deteriorating. Avon currently has an inventory of over 1,400 lots available for building. That is lots already approved but without building permits issued. When these are built, it will add over 4,000 people to our town. Despite this inventory, the Avon Plan Commission and Town Council are considering approval of the Fairwood PUD development, which will add another subdivision of 300 homes with their main entrance opening onto a heavily traveled two-lane road. The PUD concept was originally designed to be a zone for special projects that cities could use where traditional zoning codes separated commercial from residential. It would allow the two to combine to create something interesting within the city, which was a benefit to the town and the residents. A PUD should create a unique and innovative development of higher standards to justify requested deviations, but they are now being approved solely as a method to lower standards. Although our current ordinances require minimum lot size of 12,500 square feet, the Fairwood PUD would have minimum lot sizes of 7,000 square feet with homes being 10 feet apart. Considering the current status of growth in Avon, approving this type of high density housing would be highly irresponsible. Additionally, the Town of Avon has allowed the developer to proceed with the Fairwood PUD proposal without meeting even the minimum submission requirements required by the ordinance. Recently released emails also show the developer openly mocking the input from concerned citizens who will be impacted. Town Council to ignore the current zoning for that property to allow the developer to “write their own zoning district” and circumvent our ordinances. The result is a product that is inferior to the current zoning in place for that property and benefits no one but the developer who makes a bigger profit. Unfortunately, the Avon zoning authorities have embraced the concept of approving subdivisions as a PUD, which violate and undermine our current zoning ordinances. Every subdivision approved in recent years has been approved as a PUD with substandard zoning. Our position is simple, follow the law, adhere to the rules and enforce the current zoning standards. Avon must stop compromising our standards. We can do better. The Town of Avon issued the following statement regarding developments and proposals. The Town does not comment on development proposals currently in the review process, so we cannot speak to specifics regarding the Fairwood PUD proposal. However, we can provide general information on our Planned Unit Development (PUD) process. Zoning Ordinance, a PUD Ordinance establishes developmental rules for the land. PUDs can be used to allow greater flexibility for mixed use development and to encourage innovative approaches to meet the demands of the housing, commercial and industrial markets. Avon specifically limits the approval of PUDs to projects that further the purposes of the Town’s Comprehensive Plan and Zoning Ordinance and that do not unduly burden adjacent roadways or result in inadequate open space and other complementary amenities. The Town’s PUD process is long. This process includes submission of an application package by the developer, staff review, technical reviews, consultant reviews, a neighborhood meeting, an informational presentation to the Plan Commission, public hearing at a Plan Commission meeting and at least one public meeting of the Town Council. It is not unusual for this process to take between nine and twelve months to complete. The Town reviews traffic impacts that may be caused by the development. The Town may require road improvements commensurate with those impacts. Roads may need to be widened, turn lanes installed, intersections improved, or even new roads built to meet the demands of the proposed development. The Town also has a Thoroughfare Plan in place that takes a community-wide and long-term look at expected traffic increases and where roads and intersections may need improving or new ones constructed. Over the past 12 years, there have been over $100 million of infrastructure improvements in Avon for roads and trails including 9 roundabouts, 9 intersections, 2 bridges, 2 road extensions and 13 major road overlays or reconstruction. The Fairwood PUD proposal is in the early stages of the Town’s process. The developer has completed the neighborhood meeting and the informational meeting at a Plan Commission meeting. The next step in the process is a public hearing at the Plan Commission meeting on August 27 at 7 pm at the Washington Township Pavilion Center. To keep our residents informed about the Fairwood PUD proposal, we’ve established a special section for documents related to it on our website at www.avongov.org.